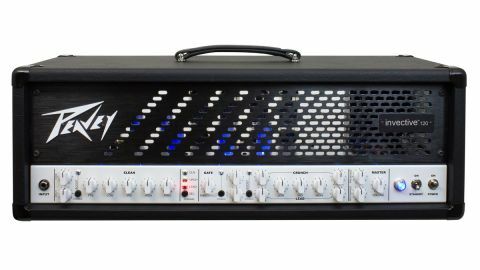 Has Peavey just made the perfect metal guitar amp? Misha Mansoor and Peavey have devised the successor to the 6505 crown – metal amps don't get much better than this. Peavey found a whole new market in 1992 thanks to a collaboration with Eddie Van Halen, resulting in the iconic 5150 head and a massive boost for the company’s rock/metal credentials. After the EVH association ended in 2004, Peavey renamed the 5150 as the 6505, which to this day remains the industry standard for metal guitarists the world over. Now, there’s a new Peavey amp that could well take over that crown - at a price. Designed in collaboration with Periphery’s Misha Mansoor, let’s welcome the Invective 120. This amp features heavily-populated front and rear control panels that remain clear and easy to follow, thanks to minimalist styling with white knobs on a white background. There are three channels for clean, crunch and lead, with a separate EQ for the clean channel and shared EQ for the drive channels, which have separate pre- and post-level controls. All three channels have separate boost functions with controls for level and tone, and there’s also a master boost level control on the rear panel. Other cool features include half-power switching, two assignable series effects loops, a noise gate on the drive channels and master presence and resonance controls. Controlling all those functions is easy because the Invective is MIDI-powered; most switched functions are accessed from the supplied 10-button foot controller, which can also store and recall up to nine preset patches. Sound-wise, the Invective 120’s three channels and programmable boosts cover every need, from high-headroom cleans to insane multi-layered distortion from the six-valve preamp, with a lightning response that’s perfect for fast powerchords, especially with the noise gate engaged. You can hear the 6505 influence, however, the Invective is more evolved and refined. The clean channel is a huge improvement, combining very high headroom with a boost, which adds a warm, vocal quality that raises the bar for amps in this genre. It’s unlikely, perhaps, but if you want to play jazz through an Invective 120, you can do it with total authority. The programmable boosts add tremendous flexibility, as each one has its own independent level and tone control, while on the rear panel you’ll find Peavey’s excellent MSDI direct output, which greatly simplifies connection to a PA or recording console - although the matching 212 cabinet does a sterling job of channelling the dynamic response. The sound quality, comprehensive feature list and the included MIDI-powered foot controller’s total recall of up to nine patches make the Invective 120 a serious pro tool, especially when combined with the matching custom-designed Celestion Vintage 30/Creamback-loaded speaker cabinet. It’s a simply stunning rock weapon from Peavey that’s in a class of its own, and is available for considerably less on the street. Even then, the price may make your eyes water, but so will the astounding tones.